For the past couple of years, DJ Mag‘s Top 100 DJs list has been lambasted for being an inaccurate measure for ranking the world’s biggest electronic dance music artists. Reasons behind the widespread criticism were valid too. For one, DJs who campaigned heavily for votes were ranking higher — making the list a popularity contest or a political game of who had the biggest PR machine behind them. Other times, DJs were accused of buying votes via giveaways and contests. However, the most critical folly of the list lays in the fact that European DJs — specifically the Dutch — dominate the list because most of the British outlet’s readership comes from Europe. Now, for the first time, DJ Mag has teamed up with Beatport to calculate the international popularity of DJs who reside solely in the house and techno scenes. 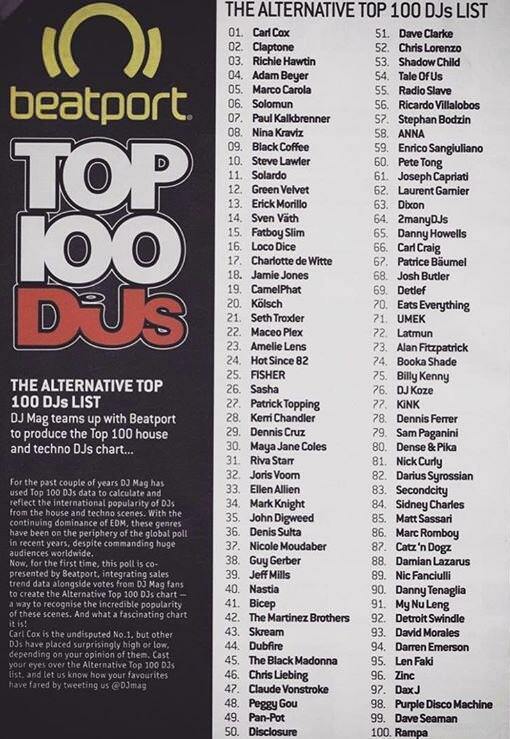 They’re calling it the Alternative Top 100 DJs chart. Funny how two of dance music’s original genres are being classified as “alternative,” right? To calculate the polling data, they’ve finally integrated sales trend data alongside fan votes in order to gain a somewhat more accurate reading of whose dominating the global scene in 2018. Not only does the list better reflect “EDM” as a whole, but also the direction the industry is moving towards. Long gone are the days when big room, electro, and progressive dominated the scene. Yet the Top 100 DJs 2018 list continues to rank those artists heavily at the top. Needless to say, house and techno fans will rejoice at the new list! It’s no surprise that Sir Carl Cox sits high atop the throne. He’s been a godfather of dance music since before most fans were even born. Coming in second is Claptone and rounding out the top five are Richie Hawtin, Adam Beyer, and Marco Carola. Interestingly, all five producers didn’t even crack the top 50 in DJ Mag’s more commercial (and strictly voter-generated) poll. Rounding out the top ten are Marco Carola, Solomun, Paul Kalkbrenner, Nina Kravitz, Black Coffee, and Steve Lawler. Other notable appearances on the list are Green Velvet, Fatboy Slim, Jamie Jones, Seth Troxler, Maceo Plex, The Martinez Brothers, Claude Von Stroke, and The Black Madonna, all in the top 50. The list is heavily dominated by US artists too, which reflects the buying power of the American music market. Music enthusiasts won’t find the likes of Martin Garrix and marshmello here. But take one peak at DJ Mag’s original Top 100 DJs of 2018 list to see how starkly different the rankings become when record sales becomes a measure. View the official results of the 2018 DJ Mag Alternative Top 100 DJs.